Background SYNGAP1, which encodes a RAS-GTPase-activating protein, is located on the short arm of chromosome 6. Heterozygous SYNGAP1 gene mutations have been associated with autism spectrum disorders, delay of psychomotor development, acquired microcephaly, and several forms of idiopathic generalized epilepsy. Here, we report a patient with a new SYNGAP1 stop mutation, and compare the phenotype with published cases with SYNGAP1 mutations and epilepsy. Patient This 15-year-old nondysmorphic girl with intellectual disability developed drop attacks at the age of 2 years, later clonic and clonic–tonic as well as myoclonic seizures predominantly during sleep. The epilepsy was well-controlled by valproic acid (VPA) and later on with levetiracetam. Electroencephalogram (EEG) showed a complete EEG-normalization with eye opening as well as photosensitivity. Magnetic resonance imaging was normal. Genetic analysis revealed a de novo heterozygous stop mutation (c.348C > A, p.Y116*) in exon 4 of the SYNGAP1 gene. 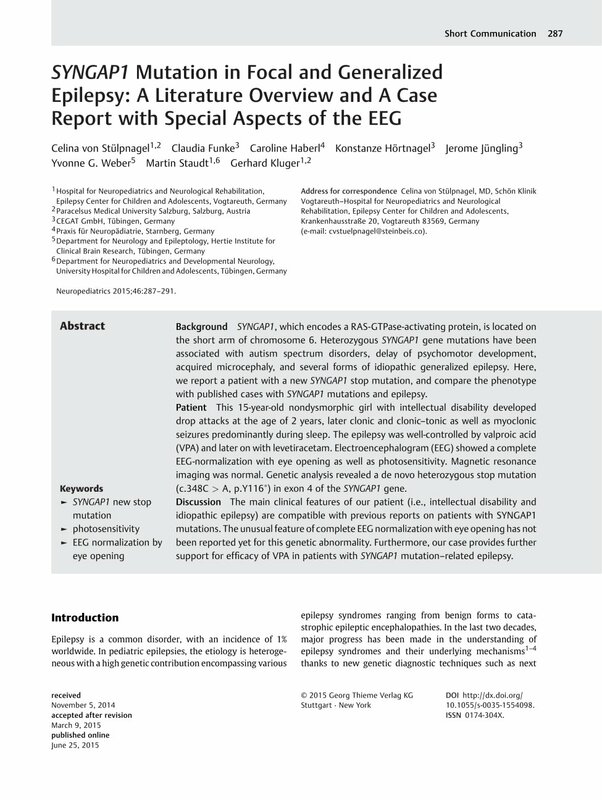 Discussion The main clinical features of our patient (i.e., intellectual disability and idiopathic epilepsy) are compatible with previous reports on patients with SYNGAP1 mutations. The unusual feature of complete EEG normalization with eye opening has not been reported yet for this genetic abnormality. Furthermore, our case provides further support for efficacy of VPA in patients with SYNGAP1 mutation–related epilepsy.